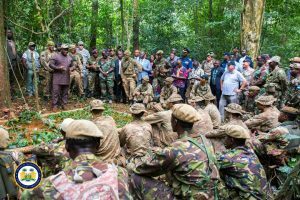 State House, Freetown, Tuesday 27 November, 2018 – His Excellency President Julius Maada Bio has paid a brief visit to the Guma Jungle Training Ground near Freetown where he received an update on the ongoing joint forces training by The Second Rifles Battalion Company in Britain and the Force Reconnaissance Unit (FRU) of the Republic of Sierra Leone Armed Forces. 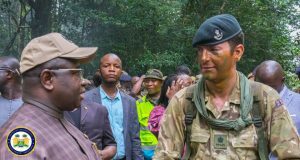 Officer Commanding, Major Robin Whyte, said the exercise presented his team with the experience to own their level of skills for the challenges in the jungle. He disclosed that the training provided the unique opportunity for exchange of knowledge between The Rifles and the FRU. 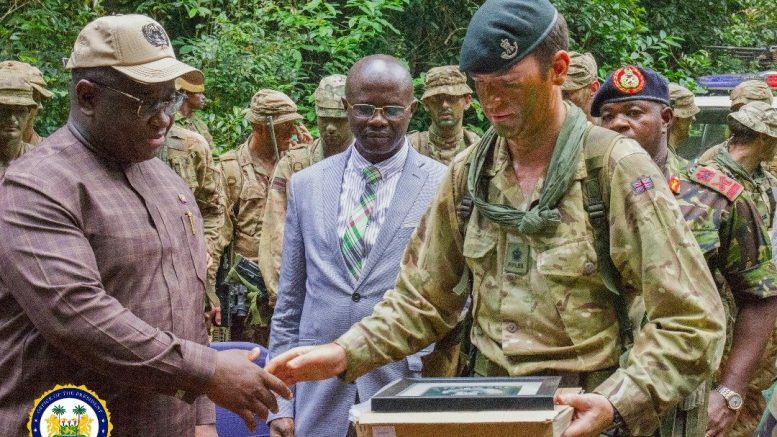 He maintained that the skills learned from the exercise would be vital to them for future deployments and also commended the government of Sierra Leone for the support given to them throughout the training. The FRU was established on 8 December 2000. Training Officer of the FRU, Captain John Thomas Bangura, said the idea of FRU came at a time when the country needed a robust unit that would provide accurate and timely information in every terrain, all weather conditions and in all places. 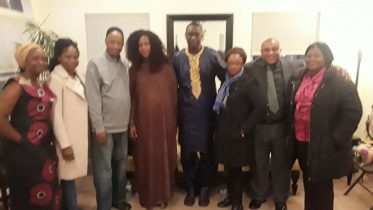 President Ahmad Tejan Kabba and the then British training team in Sierra Leone approved the idea. He said the FRU was tasked to provide the platoon and two sections for personal exercise to integrate with their partners and the Rifles for the successful conduct of the training. Captain Bangura also said that they had fulfilled the fundamental objective of the entire exercise, even though the training was still in progress because they had had mutual learning during the shortest period. “Your Excellency, it may interest you to know that the FRU has its standing operating procedures regarding drills and tactics. These procedures have never been updated since its establishment in 2000. One of the best things that have happened in this training is the new drills and tactics we have obtained, which we are going to use to update our own system so that they can be up to date. We want to be at par with the rest of the world,” he said. On his part, President Bio welcomed the British troops to the country. He said the training was a hectic one that required courage and resilience. He said although strenuous, the exercise was an important one, adding that as for the military, the jungle is home. He mentioned that: “This is a real jungle and I hope you have had a beautiful experience. It is great to meet you all, and I hope you have mutually learned from each other. Our guys have had the experience, you are coming into the jungle which you might find difficult, but that is part of the sharing of experience”. The training, which comprised 70 Rifles from Britain and 40 personnel from the RSLAF, is a joint exercise by the two forces with the focus being on jungle skills and tactics. The British troops came into the country on 11 November and had since been involved in different kinds of training alongside the RSLAF. The team will depart for Britain on 14 December ahead of other deployments in Kenya and Afghanistan. 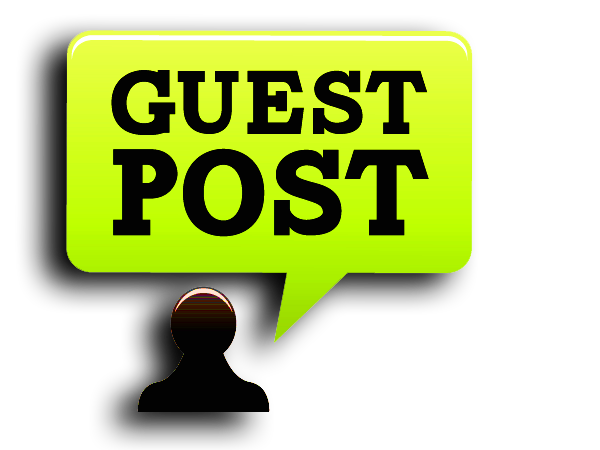 Be the first to comment on "President Bio Receives Update On Joint Forces Training"